Ideal for families with children and unique on the Baltic Sea: leisure and resort "Weissenhäuser Strand". 150 m from the sea, 150 m from the beach. For shared use: indoor pool heated (extra). Shower/WC in the pool area, childrens pool, slide, tennis (extra), childrens playground. In the complex: reception, restaurant, bar, sauna, fitness room, massage, solarium, whirlpool (all extra), bowling, table tennis (all extra), shopping facilities, boutique, kiosk, washing machine, tumble dryer (for shared use, extra), bicycle rental. Breakfast and half board possible (extra). Central parking spaces. , In the holiday residence located directly behind the dunes and only 150-400 m from the Baltic Sea with 2 km of sandy beach resort: Wakeboard and Wasserskianlage (April-October, extra), subtropical aquatic paradise of 7500 mq (extra) with 214 m of slide to buoy, 156 m of giant toboggan, 75 m of turbo slide, 3 wave slide , steep slide, 10m high games, large childrens area and sauna area, gallery (restaurants, bars), sports and games center, indoor games (bowling, billiards), Kidzclub, village square with launderette, kiosk, boutiques and supermarket, mini golf, spa with gym, dialysis center, event barn "Alm "and the worlds only" adventure jungle country "(extra) with more as 100 attractions on 6,500 m2 of covered area (high ropes climbing garden, Otterland, huge childrens play area and much more). Facilities partly extra. Year-round animation program. On request transfer from Oldenburg / Holstein train station (6 km, EUR 5.00). Mega-leisure ticket EUR 12.00-EUR 17.00 / person (off-season), EUR 37.00 / person (high season): the one-time booking and payment on the spot entitles to daily free entrance to the subtropical bathing paradise (main season daily 3 hours) without sauna area (all year EUR 2.00 / person / day, from 18 years) or jungle country adventure. TRAVEL AND SAVINGS: Stay 4 days, pay 3 days in the time 24.11.-20.12.18, 06.01.-09.02., 18.02.-06.04. and 03.11.-16.12.19 and 06.01.-07.02. and from 16.02.20 or live 5 days, pay 4 days or stay 6 days, pay 5 days in the time 24.11.18-29.06. and from 31.08.19. The daily entrance into the subtropical swimming paradise is in the time 24.11.-20.12.18, 06.01.-09.02., 18.02.-06.04. and 03.11.-16.12.19 and 06.01.-07.02. and from 16.02.20 already included in the rental price. 2-room apartment 40 m2. Living/sleeping room with 1 double sofabed and satellite TV (flat screen), radio. Exit to the balcony. 1 double bedroom. 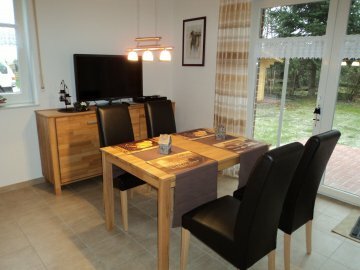 Kitchenette (4 hot plates, microwave, electric coffee machine). Shower/WC. Balcony furniture. Facilities: childrens high chair, hair dryer. Internet (WiFi, free). Reserved parking at the house. Please note: non-smokers only. Central heating. The shower/WC can be accessed via the double bedroom. The apartments are situated in the "Am Park" apartment house with lift and view of the sea. In the house (for shared use): washing machine, tumble dryer, ironing facilities (all extra) and a storage room for bicycles. In-house customer service office (open for certain hours only). Bread (-roll) delivery service on request. If you book 7 nights or more, 1 change of linen per week/person is included in the price. Extra, use of the gym with sauna and hammam is free.